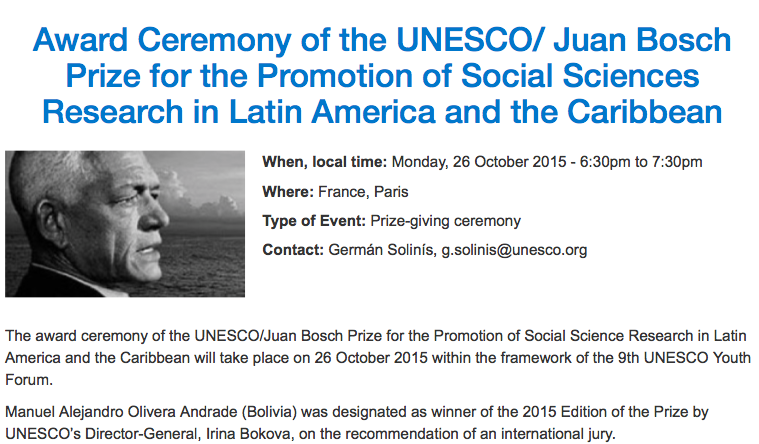 Manuel Olivera Andrade, young Bolivian researcher, receives the UNESCO/Juan Bosch Prize for the Promotion of Social Science Research in Latin America and the Caribbean, on Monday, 26 October 2015, at UNESCO Headquarters, Room I, at 6:30 pm. The ceremony is part of the 9th UNESCO Youth Forum, which brings together more than 500 young people from all over the world to focus on issues related to sustainable development and global citizenship. 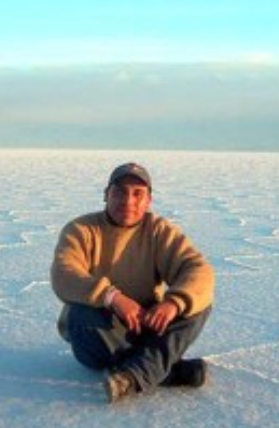 Manuel Olivera Andrade, researcher at the University of San Andrés in La Paz, recently completed his thesis on the risk factors to the Bolivian government plan, launched in 2008, for lithium harvesting in the Salar de Uyuni. “El Salar”, as it is called by inhabitants of Uyuni, is the largest salt desert in the world, located in the highlands of southwestern Bolivia. This dried salt lake, perched at over 3,000 meters above sea level, covers some 10,000 km2 and contains a third of the lithium resources of all the salt flats in the world. Why is lithium called “Gray gold”? Lithium is the lightest metal in the world. It is used for a wide variety of industrial applications, including cell phones, I-pod batteries, and other new technologies, even pharmaceutical. Combined with other metals such as sulphur, lithium has an extraordinary storage capacity and can play a crucial role in the new era of hybrid and electric vehicles. Lithium-ion batteries will make it possible to store huge quantities of energy also for other industrial and home uses. The world energy matrix – today mainly composed of petroleum, coal and natural gas – will be replaced in the near future, and lithium could become as important as oil is today. This is why it is called “Gray gold”. Can you imagine a world economy based on the lithium price and/or control of lithium resources? Bolivian Salar de Uyuni is said to contain one third of the world lithium brine reserves. What opportunities does it bring to the country? Indeed, according to our data collected between 2012 and 2014, approximately 36% of the world’s lithium brine resources are located in Bolivia. Together with Argentina and Chile, the so-called “Lithium Triangle” owns 84% of the world’s lithium brine reserves! It means that lithium could represent a window of opportunity for Bolivia, not only in terms of industrial and technological development, but also in terms of a new business agenda with its neighbours. It could help to improve the political and economic relationships between these three nations. Still, this will depend on certain political decisions and arrangements with several stakeholders within Bolivia and naturally also with Chile and Argentina. At any rate, Bolivia should undertake efforts by itself looking for an edge in the lithium market. What do you think Bolivia’s chances of succeeding are? Since 2008 Bolivia is on its way to take position on the world lithium market. But we should not forget that Chile and Argentina have more than 20 years of experience in lithium harvesting from similar brine deposits, which has been constructed mainly through so-called “foreign direct investment” (FDI). In any case, the lithium market in Bolivia will depend on the future lithium supply and demand in the world. It is a fact that the lithium price was growing almost continuously from 2004 to 2014. But what will be the future trends on a global level? There are three basic scenarios. A group of experts argue that we will possibly observe a period of lithium oversupply, because there are at least 10 new big lithium production projects around the world. The main consequence would be a drop in its price. Other specialists expect such an increasing demand from the growing lithium batteries sector that it cannot be met, because of technological barriers and geopolitical problems. In this case, lithium prices will continue to rise. Finally, of recent, a group of specialists, to which I belong, think that a real lithium boom will occur in the years to come, once the Lithium-Ion Battery Megafactories, now under construction, will start to work, for example in Nevada, United States, or in Nanjing, China. The electric automobile market will be genuinely developed between 2017 and 2020, depending on the rhythm of adaptation of consumers and the encouragement policies of governments. In 2008, the Bolivian government launched a plan for lithium industrialization, based on domestic investment and technology development. Could you tell us more about this. This national project for lithium production aims to extract lithium of the Uyuni salt flat and also to industrialize it. It is established in three phases. 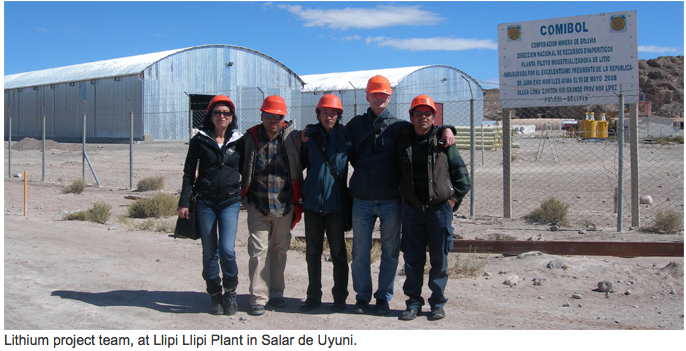 The pilot phase (2008–2015), implies lithium carbonate and potassium chloride experimental production, with 100% Bolivian technology. The industrial phase (2016–2019) forecasts 30.000 ton of lithium carbonate production and 700.000 ton of potassium chloride production. Finally the third phase involves lithium-ion cathodes for battery production. No foreign partners will be accepted except in the third phase. This is a big difference with Chile and Argentina. Does Bolivia possess the necessary expertise – scientists, economists, managers, and environmentalists – to deal with such a plan? In my view, Bolivia has the expertise to carry out this plan. It is not the first time that the country researches the potential impact of its lithium resources. But 25 years ago, when FMC Corporation wanted to exploit lithium in Uyuni, the conditions it offered were so disadvantageous for Bolivian people that the project failed. In fact, the first studies came from Bolivian universities, with support of scientists from France and the United States. 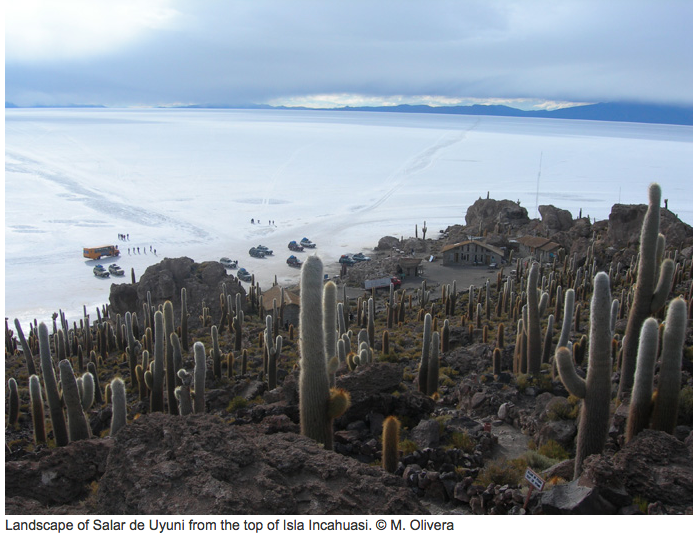 Findings of research undertaken between the 1970’s and 1990’s, were crucial for defining the importance of Uyuni lithium in a world context. It seems that all this potential fell into oblivion after the failure of negotiations between the Bolivian government and the FMC. But I am convinced that public universities, such as San Andrés in La Paz and Tomás Frías in Potosí, still have important potential to deal with this kind of challenges. Many researchers and experts, despite some difficulties, continue to work not only on lithium, but also on a series of relevant issues, like environmental studies, natural resources economy and technology. Currently, there is a new boom of research and proposals on lithium exploitation. Why, in this context, has the lithium sector not been more developed over the past decades? Revenue-absence. For the time being, the lithium sector does not generate income and consequently, the issue has not become (except during the conflict with FMC, 1989-1993) part of the national debate on natural resources and development. Partial development of the technology. Bolivia has accumulated knowledge about lithium as natural resource, but lithium sustainable use still requires a set of new skills, capabilities, knowledge and technology, which must be strengthened gradually. Market conditions indicate that new investments were not viable before 2000. Between 2000 and 2014, lithium carbonate price tripled (from approximately 2,000 to 6,000 US dollars per ton) and world demand increased significantly, so that this last decade was promising for new investments and we observed new mergers and acquisitions. Historical experience also slowed down the development of the sector. The inhumane exploitative systems – that caused thousands of deaths in the 16th and the 19th centuries – are etched into the memory. Even if the actors, the conditions and the targets were different from nowadays, the majority of leaders and organizations today trust – or at least they openly claim to trust- that the public investment is the one that will enable Potosí to achieve its long-awaited prosperity. Different visions of development. Two historical visions have coexisted up to now: the believe that States, through their national government, must decide the destiny of natural resources; and a pragmatic vision, assigning a key role in development and improvement of national capabilities to foreign direct investment. A third vision emerged with force over the past years, focusing on short-term benefits; in other words, extract lithium for exportation and monetary returns. Normative-barriers: in the past years, a normative lock prevents organizations from participating directly in the business, reducing them to the rank of observers. Lithium is defined as a strategic resource in the Bolivian Constitution and the central government is the only manager and investor in the sector, at least until lithium extraction and production phases. Regional or local governments are therefore excluded. Information-asymmetry: the fact that lithium is a new business for Bolivians, coupled with the information asymmetries, makes it difficult for the majority of regional leaders, local communities, the population and even media, to fully understand the implications of the lithium business for the economy and for people’s lives. Are local people from Uyuni involved in the government plan and how? From my point of view, local communities, coming from various ethnic groups, and local s in the area of Salar de Uyuni must imperatively be involved in the project. For the time being, they are not. Even if it is assumed that local people will be employed for basic operations in production plants, it is not yet clear how this project will benefit local communities. It will be necessary to find mechanisms to share future revenue from the commercialization of lithium, which is not an easy task. There are big differences in terms of development visions and practices, regarding territory and natural resources. The government plan must adopt an integral vision, including social and environmental aspects, beyond the present technological and commercial emphasis. Project managers and central government have to address this challenge: they must take into local people’s expectations; negotiating, in good faith, with local and departmental actors, the best ways to return benefits to the region. The government plan has to include employment and socially responsible policies: better wages, local investments, and links to other economic sectors (i.e. tourism, farming, agriculture). Could you tell us more about the social aspects? What are local people’s main activities and how could they be affected by the government project? Presently, the most important economic activity within the perimeter of the Uyuni salt flat is the ulexite exploitation (also known as TV rock). There are mainly two local cooperatives, which employ more than 200 workers from the Rio Grande community. Near to the Uyuni salt flat, the San Cristóbal Mine Company (Japanese capitals) operates since 2008. This is the biggest open-pit zinc-lead-silver mining operation in Latin America and the third biggest silver mine in the world. The mine employs more than 800 people, mainly from the neighbouring communities. 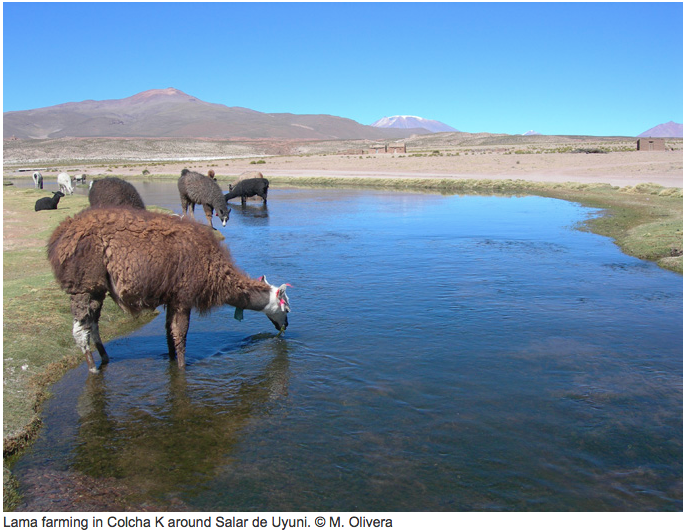 If you look at adjacent lands, you will find traditional quinoa agriculture and lamas’ livestock farming everywhere. Finally, there is inclusive tourism, where many peasants are involved as small tourist service providers, mainly through accommodation infrastructure. Sooner or later, ulexite deposits will stop functioning at least in the current exploitation area of Rio Grande, because salt is a non-renewable resource. Employees are considering lithium plants as a unique way to solve their future unemployment. The same applies to communities and workers at the San Cristóbal plant, which will probably stop operating around 2025. In fact we are living again a mining crisis in Bolivia, in terms of lowest prices and unemployment. With regard to quinoa producers, they were quite indifferent to the growing lithium market, during the last ten years, because they were benefiting from high quinoa prices. However, the present decrease in the quinoa price could change their expectations of the government lithium project, just as the employees in Rio Grande and San Cristóbal. Technology used for extracting lithium from brine could imply use of large quantities of chemical inputs and consequently large quantities of environmental liabilities. One of the most important challenges for the next months will be to clarify and establish detailed studies on the environmental consequences of the current extraction method. If project managers do not adopt measures to control the use of this kind of input and liabilities, there will be an important impact on the salt flat, and consequently, on the landscape. In addition, we do not have enough information on water demand, but it is very likely that the project will require large quantities of water. Extraction methods adopted in Bolivia are based on the use of evaporation pools, where large quantities of water are deposited, in order to obtain lithium by physical and chemical processes accelerated by evaporation. Lithium extraction through this method implies the use of large quantities of water and chemicals, after the use of evaporation pools. Its environmental impact has not been adequately studied. More information on environmental issues must be gathered and disseminated. In your opinion, should young researchers like you, help to disseminate this kind of information and try to influence political decisions? As a young researcher, I must admit that it is quite difficult to be heard by political segments. Particularly in the case of lithium extraction and politics around it, most of the national debate is focused on a few sectors with weak participation from universities. This is not due to the absence of proposals. On the contrary, universities, as I mentioned before, have a huge potential to strengthen and address many of the government project’s challenges. But, many of their proposals and capabilities are ignored. In this sense, the challenge for young researchers is two-fold. On the one hand, we face the challenge of positioning ourselves in the competitive academic sector, particularly within the social sciences. In fact, only few students have the opportunity to work on research in medium and long-term projects. I had the opportunity to get a scholarship for two years in San Andrés, and carry out my thesis, which was awarded by UNESCO. This is an exception. And it should become the rule in Bolivia. On the other hand, we must be able to reach out and be heard by other segments of the population, beyond the narrow circle of colleagues and professors, and to influence public opinion. In other words: the challenge is to create bigger social capital around ethical, social and environmental issues, especially regarding the use of natural resources and their effect on our lives. 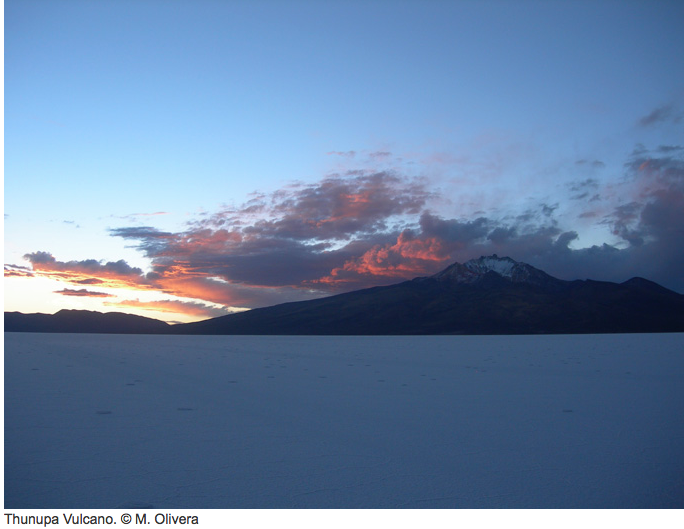 Possibly, the majority of people think of lithium as a resource which will remain far from urban centres… in the “empty Altiplano” without any influence on their lives. This kind of thinking must gradually change, and we, young researchers, we need to keep working on that. Do you think the results of your thesis on risk factors of the government project will be heard? 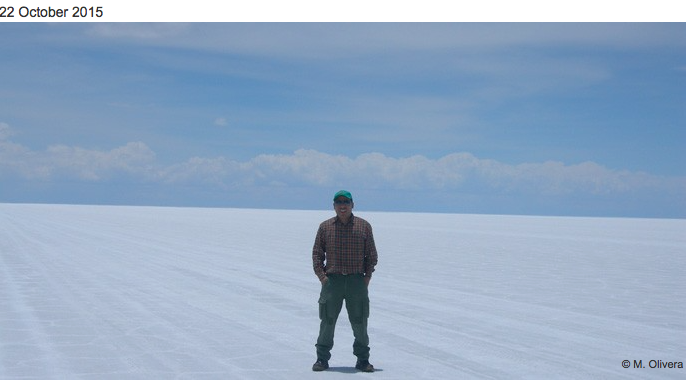 For me it is clear that my research contributes to knowledge on topics which have not been clearly considered before in the debate on lithium in Bolivia. It is crucial to increase access to information about lithium possible, namely on the consequences for people’s lives and the national economy. In this sense our role as researchers is to contribute to dissemination of this knowledge. We have to make it possible for a wider public to get better quality information, in simple and understandable terms. Well-informed people have expectations which are closer to the reality. They can seize opportunities faster and influence politicians through interpellation. In social sciences there is a very interesting concept called “translation”. According to the Portuguese sociologist Boaventura de Sousa Santos, this term refers to the process whereby knowledge ceases to belong only to privileged segments of the population. “Translation” thus means that our scientific knowledge turns into popular ideas and forces political power to adopt pertinent measures to ensure a better life. “Translation” also means that popular ideas, different visions of life, local knowledge and experience accumulated throughout history, are acknowledged by scientists, bureaucrats and politicians. “Translation” is one of the main challenges for researchers; one that we all too often tend to forget. I welcome Manuel Olivera Andrade to The Hall of Bolivian Fame! This entry was posted in Bolivia, Economics, Energy, Environment, Health, Potosi, Tourism and tagged competitiveness, energy efficiency, environmental awareness, lithium market, UNESCO. Bookmark the permalink.